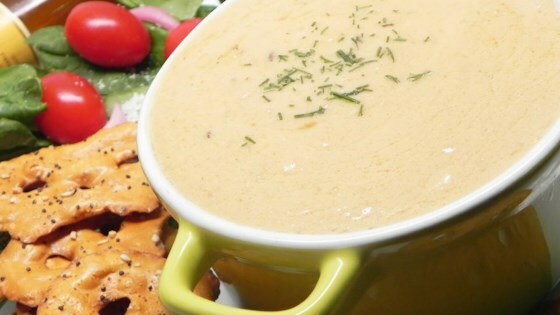 "A great Cheddar-based fondue recipe for dipping cubed pieces of French bread, broccoli, cauliflower, baby carrots, or Granny Smith apples!" Mix Cheddar cheese and flour together in a bowl. Bring beer to a light boil in a fondue pot; add garlic, Worcestershire sauce, and mustard powder and stir. Gradually stir cheese mixture into beer mixture. Reduce heat to low; cook and stir mixture until cheese is melted, about 5 minutes. Made as written and this was good. My only recommendation is to add a bit more Worcestershire. That is all. Very easy and delicious! Definitely try with granny smith apple slices. Sooooo good!!! Not bitter at all! I used a dark beer and added a tsp. of chipotle powder. Very good recipe. Used it with a sourdough bread bowl. This turned out pretty good. I substituted fresh garlic and soy sauce, because I was out if worcestshire. I mad open face beef brisket sandwiches with the cheese sauce ladled on top! Made exactly as instructed and it turned out really nicely. The worcestshire cuts the bitter beer taste. Served with brats, broccoli, apples, and bread.